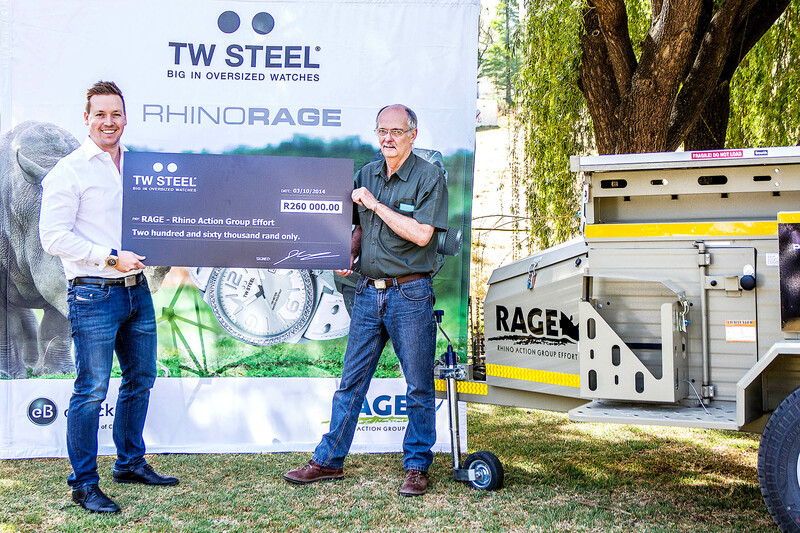 Johannesburg –RAGE has unveiled four specially-designed trailers, developed with funds raised through a TW Steel initiative, to be used in the fight against rhino poaching. The tailor-made trailers will be covertly deployed with Anti-Poaching Unit (APU) personnel to undisclosed locations in reserves on the western side of the Kruger National Park as well as in the Eastern Cape. TW Steel, the global lifestyle brand ‘Big in Oversized Watches’, is proud to announce that its fundraising initiative, launched in September 2013, has raised R260,000 to date. ‘The Watch in Steel’ brand produced a limited four-model collection based on its popular Canteen Style timepieces; incorporating the RAGE logo and sold exclusively through a dedicated web-store with retail proceeds donated directly to RAGE. The self-sustaining trailers are equipped with a solar panel, providing power to three deep-cycle batteries, which in turn charge radios, maintaining communication lines. A freezer also runs off the system, benefitting personnel deployed in extremely high temperatures of 38 to 40 degrees, keeping their food supplies cold. A panel on the trailer unfolds into a gas stove for cooking purposes. Gas is used as opposed to wood fires, to keep the team’s footprint to a minimum so as not to warn poachers of their presence. The space inside the trailers is used for storing food, water, bedding and tents. Teams of 6 to 10 members are sustained for a period of up to 10 days before being re-supplied or re-deployed elsewhere. RAGE has thanked TW Steel for its enduring support in this and other initiatives. To offer your support, purchase one of these limited edition TW Steel Rhino RAGE watches on www.twsteelrhinorage.co.za. The watches can also be purchased using eBucks through www.ebucks.com. 50% of the proceeds go to RAGE.